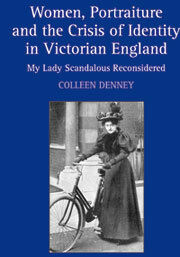 University of Wyoming Art Professor Colleen Denney recently released her new book, "Women, Portraiture and the Crisis of Identity in Victorian England: My Lady Scandalous." The book examines the lives of four prominent Victorian women who steered their way through scandal to forge unique identities. Denney also looks at the fascinating power of celebrity, and how it was as much of a phenomenon in Victorian times as it is today. The women are: Mary Elizabeth Braddon, Lady Dilke, Sarah Grand and Millicent Garrett Fawcett. "Fawcett, who fought for women's suffrage for over 50 years of her life, is one of my scandalous women," says Denney. "Working on her has led me into the Edwardian era and the work/imaging of the suffrage women." Denney argues that portraits, whether painted or photographic, became tools the women used to negotiate their controversial identities. "Their portraits were more than speaking likenesses," says Denney. "They used their portraits as tools of persuasion, performing a domestic masquerade to secure privacy and acceptance." "Women, Portraiture and the Crisis of Identity in Victorian England" is now available through Ashgate Publishing.